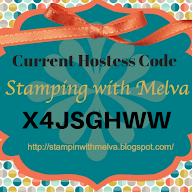 Stamp with Melva: It's getting close! Are you excited? Only 3 days to go until the new Annual Stampin' Up! catalogue is live. I'm so excited! 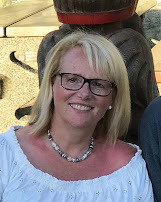 There are some amazing new products and colours coming out - I know you are going to love them all. Have you received your catalogue in the mail yet? You should have, if you have purchased from me in the last year. If you live in Canada and want one, email me or leave a comment on this blog post. I'll be happy to send you one. Today I'm sharing a card that show cases the Nature's Poem Suite of products. I just love this stamp set with the coordinating Framelits. 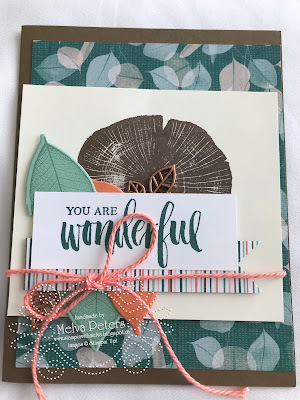 The card shows off one of the new In Colours - Grapefruit Grove - which has quickly become my favourite. Doesn't the orange colour make you smile! You'll be able to order from the new catalogue starting at 11am on June 1st! You can order through my Online Store or by email me. Which every way you order, make sure you use the host code NWKYJSJT and I'll send you a set of cards with instructions as a Thank You. If you order is over $200, please don't use the host code - you'll get Stampin' Rewards, but I'll still send you the same Thank You gift!